Filling your home with the rich, savory aroma of gourmet comforts is as easy as turning on your oven with these simple, freezer-to-oven selections! Delight your family with meals including rich, luxurious Steak Burgundy in Pastry or Beef Shepherd's Pie loaded with real beef and premium veggies. 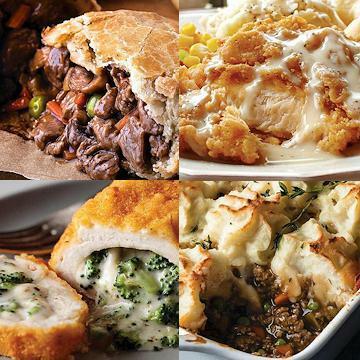 Hand-picked for ease, each of these comfort food dinners is a hearty meal everyone gathered around will love, guaranteed! Order with complete confidence today. Do Not Thaw! For safety, cook to an internal temperature of 165�F, as measured by use of a thermometer. Oven: Preheat oven to 425�F. Place desired portions in lightly oiled pan. Beat one egg with 1 Tbsp. of water. Brush over the tops and sides of each pastry. Bake, uncovered for 40-45 minutes or until pastry is golden brown. FROM THAWED: Thaw in refrigerator. Oven: Preheat oven to 400 degrees F. Remove thawed roast and juice from package and place in covered pan. Bake for 40-50 minutes. FROM FROZEN: Microwave: Place frozen roast and packaging upside down in microwave safe dish. Microwave on DEFROST for 30 minutes, turning over half way through cooking. Cut 2 small slits in packaging, microwave on high for 15-17 minutes. Remove from packaging. Slice and serve with au jus. Do Not Thaw! Keep Frozen Until Ready To Cook. Appliances vary, adjust cook time accordingly. FOR FOOD SAFETY AND QUALITY, FOLLOW THESE COOKING INSTRUCTIONS. FOOD MUST BE COOKED TO AN INTERNAL TEMPERATURE OF 165�F AS INDICATED BY A FOOD THERMOMETER. Conventional Oven: Preheat oven to 400� F. Remove chickens from packaging. Place desired number of portions on a lightly oiled, foil lined sheet tray. Bake uncovered for 48 minutes. Convection Oven: Preheat oven to 350�F. Remove chicken from packaging. Place desired number of portions on a lightly oiled, foil lined sheet tray. Bake uncovered for 35 minutes. Do Not Thaw! Uncooked: or safety, must be cooked to an internal temperature of 165�F, as measured by use of a thermometer. Oven: Preheat oven to 400�F. Remove chicken from packaging and place on a foil lined baking sheet. Place on center rack of oven. Bake for 15 minutes. Flip over chicken and bake an additional 10-12 minutes or until internal temperature reaches 165�F. Ingredients: Pastry (Enriched Flour [Wheat Flour, Niacin, Iron, Thiamin Mononitrate, Riboflavin, Folic Acid], Butter, Water, Sodium Stearoyl Lactylate, Salt), Cooked Beef Tenderloin Pieces, Water, Red Wine, Peas, Carrots, Mushrooms, Onions, Soy Sauce (Water, Wheat, Soybean, Salt, Lactic Acid, Sodium Benzoate), Tomato Paste, Worcestershire Sauce (Distilled White Vinegar, Molasses, Sugar, Water, Salt, Onions, Anchovies, Garlic, Cloves, Tamarind Extract, Natural Flavorings, Chili Pepper Extract), Brown Sugar, Molasses, Modified Food Starch, Beef Base (Roasted Beef Including Juices, Autolyzed Yeast Extract, Hydrolyzed Soy Protein, Potato Flour, Dry Whey, Caramel Color, Flavorings, Corn Oil, Paprika), Salt, Garlic, Spices. Contains: Wheat, Soy, Milk, Fish (Anchovies). Ingredients: Mashed Potatoes (Water, Potato [Diced Potatoes, Potato Flakes], Whole Milk [Milk, Vitamin A Palmitate, Vitamin D3], Butter [Cream, Salt], Salt, Sugar, White Pepper), Beef, Water, Onions, Peas, Carrots, Beef Broth Flavor (Beef Broth [Salt], Natural Flavor), Tomato Paste, Celery, Modified Corn Starch, Green Peppers, Sea Salt, Sugar, Spices, Worcestershire Sauce (Distilled Vinegar, Molasses, Corn Syrup, Water, Salt, Caramel Color, Garlic Powder, Sugar, Spices, Anchovies, Tamarind, Natural Flavor), Xanthan Gum, Natural Flavor.